I am inching closer to ditching meat, but I’m not quite there yet. When you come from Chicago, land o’ beef, it’s hard to get it out of your system. This is especially true during grilling season. In my neighborhood, it seems like every night is a festival of smoke ‘n smells, and it ain’t tofu they’re searing. Just when you think you’re ready for a life of salmon burgers, you get a whiff of beef on the barbie and your inner carnivore roars. After Labor Day, when people stop fooling around with outdoor cooking stations and retreat to their kitchens, I swear I’m going to start developing those recipes for soy loaf and quinoa hash. But tonight, hey, it’s not like Bill’s coming for dinner. So, I’m grilling a big ol’ steak. 1. In a bowl, combine the mustards, olive oil, thyme, rosemary and garlic. Coat the steak with the mixture, cover it and refrigerate it for at least six hours or overnight. 3. Place the steak on a cutting board, tent it with foil and let it rest for about ten minutes. Slice it across the grain and serve. This entry was posted on Friday, August 26th, 2011 at 3:26 pm	and is filed under Meat Me. You can follow any responses to this entry through the RSS 2.0 feed. You can leave a response, or trackback from your own site. 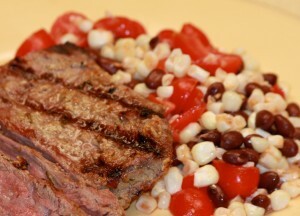 Jessica, this would be wonderful with flap steak…a super yummy cut of beef to grill. I found it by accident when I picked it up instead of flank steak, and googled it to find out that it is the ‘butchers best kept secret’! I’m converted.